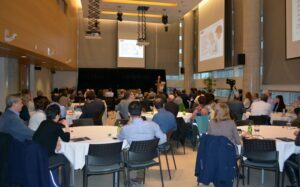 The Telfer School of Management welcomed over 80 health professionals, business leaders, civil servants and students on Wednesday, April 19 for an event organized by the Telfer Health Transformation Exchange (THTex) featuring Jean-François Beaulé, Dr. Deneen Vojta and Dr. Todd Staub of the UnitedHealth Group. After brief introductions from the Exchange co-leaders, Professor Wojtek Michalowski and Dr. Michael Fung-Kee-Fung, Mr. Beaulé, Executive Vice President, Health Plan Division/Performance, gave an overview of the UnitedHealth Group, its organization, and its strategic focus on innovation and advancement of benefits designs to better serve the population. Dr. Todd Staub, Senior Vice President for Physician Relations at OptumCare, spoke about OptumCare – healthcare delivery arm of the UnitedHealth Group – and the company’s experience and the challenges of using big data to achieve the quadruple aim approach with healthcare – quality, affordability, patient experience and provider experience. 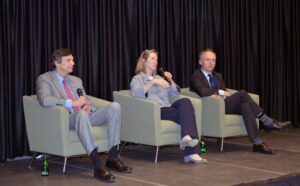 Dr. Deneen Vojta, Executive Vice President, Research & Development, described how research informs healthcare decisions. She gave the example of youth with Type 1 Diabetes using their smartphone for monitoring of their insulin pumps and how, apart from the improved medication compliance, such technology supplies physicians with very valuable information to be used in patient management. Mr. Beaulé concluded the seminar by speaking about how data and data visualization is used by the UnitedHealth Group in the personalization of healthcare delivery. After the presentations, a Q&A session followed with members of the audience asking a number of insightful questions. We thank everyone for making this one of our most successful events yet. Click here for the PowerPoint PDF.